Massachusetts metallers ALL THAT REMAINS have commenced pre-production on their new album with producer Josh Wilbur, who has previously worked with LAMB OF GOD and GOJIRA. The as-yet-untitled follow-up to 2012's "A War You Cannot Win" is tentatively due before the end of the year via Razor & Tie. 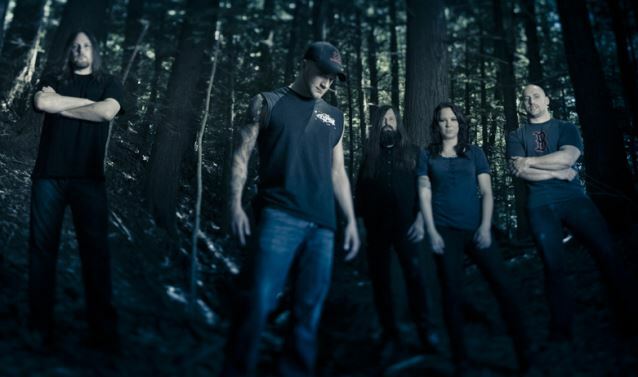 Speaking to Artisan News at SESAC's 18th annual Pop Awards at The New York Public Library in May, ALL THAT REMAINS guitarist Oli Herbert stated about the band's songwriting process: "Usually, I write a lot of the guitar parts. A lot of times Mike [Martin, guitar] will have an idea or Jason [Costa, drums] will have some good drum ideas. You know, we bounce things off each other and arrangements come together. Phil [Labinte, vocals] takes care of all the lyrics. And there you go." ALL THAT REMAINS had a huge single earlier this year with "What If I Was Nothing", which was very different for the group. Labonte told The Pulse Of Radio that not everyone in the band was on board with it at first. "There was definitely conflict in the beginning," he said. "There are people that come from, you know, a school of thought that like this is what you're supposed to do and that's what you do. But you either play inside the safe zone or you really push the envelope, and pushing the envelope is a risk. That's the thing about trying new stuff — you're not gonna know when it's gonna, you know, strike a chord with people. You have no idea." The "What If I Was Nothing" video was directed by Rasa Acharya and Dan Kennedy of Little Sky Film (SAY ANYTHING, WE CAME AS ROMANS). "A War You Cannot Win" debuted at No. 13 on the Billboard Top 200 with over 24,700 units sold in its first week and has sold over 115,000 copies to date.